Below is information on Winter Trails that can be enjoyed in and around Leadville and Lake County. Note that our organization does not maintain or groom any of these trails! We just try to get out and enjoy them. Trails are groomed by volunteers and/or paid employees from the High Riders Snowmobile Club, the Cloud City Wheelers, Lake County, Colorado Mountain College, Mt. 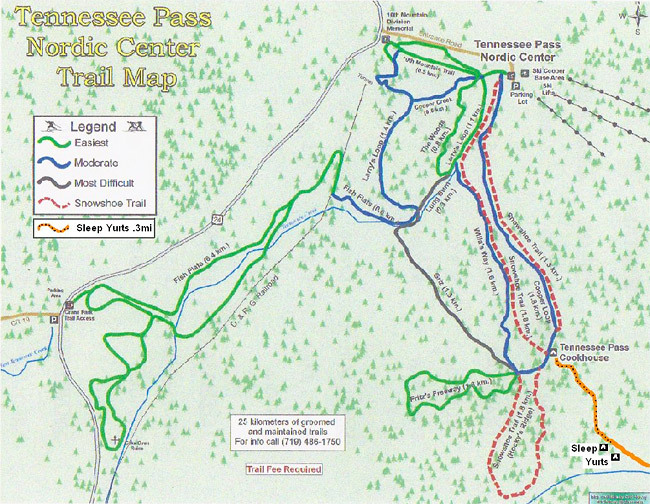 Massive Golf Course, the Tennessee Pass Nordic Center, and the Mineral Belt Trail Committee. Donations to the High Riders Snowmobile Club, the Cloud City Wheelers, Mt. Massive Golf Course, or the Mineral Belt Trail Committee are appreciated. Grooming updates can be found on the websites linked below, or our grooming blog, or our Twitter, or our Facebook. Dedicated on July 29, 2000, this trail loops the city of Leadville, traveling through aspen groves, conifer forests, wildflower meadows, and open vista sage parks. The Mineral Belt Trail is a 11.6 mile all-season non-motorized ADA accessible route with numerous trailheads and access points. Approximately six miles of this trail meanders through the historic Leadville Mining District. It offers unsurpassed views of the Sawatch and Mosquito ranges. Expect bikers, walkers, skiers, and leashed dogs. The Cloud City Wheelers groom 8 miles of trails on the Timberline Trails System located within riding distance of town right behind Colorado Mountain College. Trails are typically groomed after 4 inches of snow or more or as needed. All junctions have maps. These trails can also be combined with the other groomed trails in the area including the Historic East Side Mining District and the Mineral Belt Trail. Expect bikers, skiers, and dogs. A visit to Leadville is not complete without visiting Leadville’s Mining District, which is located immediately east of and adjacent to Leadville. The main roads east of town and several connecting roads are groomed during the winter for easy access to the Mining District by snowmobiles, skis, snowshoes, or hiking. Grooming starts where the county stops snowplowing on CR 1 (5th St) and CR 3 (7th St). CR 6A in Iowa Gulch is also groomed, depending upon user demand and snow conditions. This is a 14 Mile Loop around scenic Turquoise Lake. Multi-user friendly so expect skiers, snowmobiles, bikers, and dogs. Trail runs both directions so you may face on-coming traffic. Parking lot at and at dam. The CMC Trails are groomed by the college's Ski Area Operations students and are open to the public. A recent road and realignment has made these maps somewhat outdated. These trails intersect both the Mineral Belt and the Wheeler's singletrack trails. With beautiful views of Mt. Massive and Mt. Elbert, these beginner trails wind in and out of the forest along the golf course fairways. Overlooking the stunning Sawatch Mountains, our spacious Nordic Center is your gateway to all day winter fun! Skis, snowshoes, coffee bar, beer & wine, soups & sandwiches, a toasty woodstove, and a large sunny deck. Enjoy over 27 kilometers of set track and wide skate lanes on a groomed trial system offers ample terrain for every style and ability of skier. Since this is a privately owned and operated nordic center, there is a trail fee.